But we’ve needed to get around London whatever the weather since time immemorial, and the Underground saw this as a selling point early on. 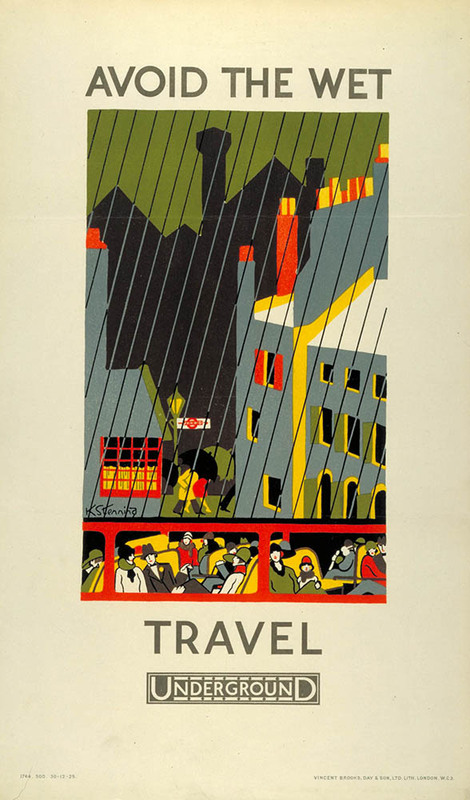 The Underground Electric Railway Company Ltd was a master of identifying its customers’ needs in publicity: in 1925 it commissioned Kathleen Stenning to produce a series of simple but striking panel posters. These were displayed in Underground car interiors, as well as on the inside and outside of buses and trams. Because they did not have to fit a standard frame or wall space, they are smaller than other poster formats and vary slightly in size. Incidentally, you can buy this poster online at the London Transport Museum Shop.